The big news here in Israel has to do with winter, all right. But most definitely not the Islamic sort (which I’ll get to below). We’ve been hit with severe weather. 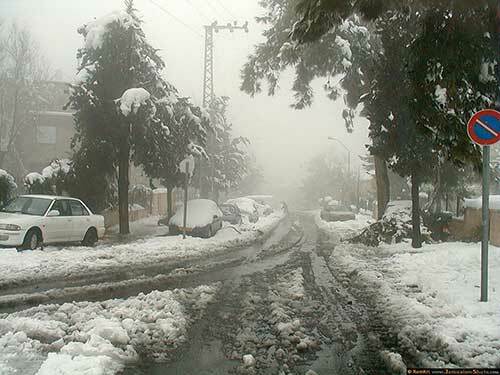 In Jerusalem, it started with torrential rain and high winds yesterday, and turned to snow overnight. Bitter temperatures and more snow, probably mixed with sleet, are due in the next two days. Traffic is snarled, and routines are disrupted – main roads are closed. In the north, in Gush Etzion, Beit El, Hevron, the Shomron, and other places that are higher, the snow fall has been heavier. From my window right now, it’s very lovely, as every branch of every shrub is covered. And there is yet another benefit to the weather: Kerry was scheduled to meet with Netanyahu today to advance that “peace process” with ever more vigorous plans. But the snow caused a postponement. What timing! Yesterday I wrote about the law, know as the Prawer Plan, that had been advanced by former minister Bennie Begin. Today he pulled the bill for lack of support. You might assume that the lack of support was a signal that most MKs think it was not fair to the Bedouin, but the contrary is the case. And Begin said explicitly that this action was not as a result of the riots. “About 260,000 Bedouin live in Israel, mostly in and around the Negev in the arid south. Members of this minority regularly settle on land they do not own, and then violently refuse to evacuate it. The Prawer Plan would have offered some of the Bedouin generous compensation for land they had grabbed, and relocated them to communities that could receive proper services from the state. “Now the outline can be amended and the necessary corrections inserted into the bill, so that it truly deals with the problems of the Bedouin population and does not serve a tiny, interested group of ownership claimants, to whom it doles out hundreds of thousands of dunams. I would like to share a few highlights of that talk. Not only are we not witnessing a “spring” (a political blossoming) with regard to what’s happening in Arab states such as Egypt and Syria, but the phenomenon is not even exclusively “Arab.” Rather, it is Islamic, affecting nations within a swath that encompasses everything from Afghanistan to Mali. An Islamic Winter. A period of unrest and violence. With all of the differences that adhere in these various states, says Prof. Yisraeli, what binds them is an Islamic vision. Interestingly, one of the things that has sparked violence in some of these nations is a sense that there has been a de facto return to a monarchy. At an earlier time, in these places, there had been monarchies, which were ultimately overthrown. Regimes of a totalitarian nature replaced the monarchies, but those regimes held within them the potential for change. What happened in several instances is that the totalitarian rulers insisted upon being followed by their sons. This was true in Syria, for example, where Bashar Assad took over from his father, Hafez Assad. In Egypt, Mubarak wanted to be succeeded by his son as well, and this behavior was manifested in other countries. This signaled to the people that there was no chance for change, that the country was in the iron grip of a single family. Yet another problem that is endemic now to several countries of the region has to do with reductions in the quantity of food being grown – particularly where there are draught conditions – at the same time that the populations are expanding. The potential for crisis is growing ever greater. When I left the U.S. in 2001, and came to Israel as an olah (a new immigrant) I was eager to share personal impressions and solid information about the situation here. Thus was my listserve born. This list has grown, and its content and style have been refined. Now I do several postings a week, offering both reliable data and analysis. Shortly after initiating my listserve, I began to work professionally as an investigative journalist for the Center for Near East Policy Research. Today I serve the Center in a consultant capacity. I work, as well, as a freelance writer. New Jersey born and bred and a resident of Maryland for several years, I have been living in Jerusalem since shortly after my arrival in Israel. If there has been a constant in my work over time, it has been my writing, but in many ways my background has been eclectic. My bachelors degree is in psychology and my masters in counseling and human services. I took up the cause of the Jews of Ethiopia in the 80s and early 90s, via the American Association for Ethiopian Jews; I worked in the field with people newly arrived in Israel, and assisted with relief and rescue efforts from the States. I then turned to designing softskills software -- training in the computer on diversity, stress reduction and using your whole brain effectively -- and producing Jewish educational software and hard copy materials. Simultaneously, I conducted live workshops on stress reduction, Jewish identity and more. For a period of time, I worked with a top non-governmental anti-terrorist in the US. This led, fairly directly, to my investigative journalism. My articles have appeared in such venues as Azure Magazine, The Jerusalem Post, FrontPageMagazine.com, American Thinker, Arutz Sheva, YNet, National Review Online, The (Philadelphia) Jewish Exponent, Midstream, Present Tense, The New York Times, Baltimore Jewish Times, Outlook, Amit, The Evening Bulletin (Philadelphia), and The Aish website. I have produced several major reports on UNRWA for the Center for Near East Policy Research, as well reports on the true nature of Fatah, the dangers of funding PA security forces, the Israeli NGO Adalah, and more. I have written three books: Disclosed: Inside the Palestinian Authority and the PLO in 2004, and Falasha No More (for children) andTreacherous Journey: One Man's Escape from Ethiopia, both in 1985. I have done interviews with BBC online, FrontPageMagazine.com, Voice of America, IBA English News (Israeli TV), and IsraelNationalNewsTV. I am on the Board of Advisors of EMET, a Washington based organization dedicated to providing policy makers in the US with accurate information.